SUPERIOR, Wis. (AP) -- Lines of thunderstorms crawled across northern Minnesota and northern Wisconsin on Sunday after overnight flash flooding washed out roads and highways, as a heat wave sent temperatures into the high 90s elsewhere in the Midwest. The National Weather Service issued flood warnings from east-central Minnesota across northwestern Wisconsin because of the potential for rainfall rates exceeding 2 inches per hour in some places. U.S. Highway 2, a major thoroughfare across northwestern Wisconsin, washed out early Sunday about 10 miles west of Ashland, the Bayfield County Sheriff's Office reported. The Wisconsin Department of Transportation said a lengthy detour was in place. KBJR-TV reported that the waters surrounded an animal shelter along the highway in Ashland, forcing the owners to evacuate 15 dogs and four cats to a nearby farm. Storm runoff moving down the Nemadji River after two days of heavy rain and thunderstorms also raised concerns in Superior, Wisconsin. Mayor Jim Paine said officials expected the river to continue rising and flood U.S. Highway 2 on the east side of the city, which would require a "very lengthy detour" that he said may be impractical for most people, Minnesota Public Radio reported. "Residents of the Allouez and Itasca areas should prepare immediately as your way in and out of the rest of Superior may be cut off soon," Paine said on Facebook late Sunday morning. Parts of Wisconsin Highway 35 were closed south of Superior in Douglas County due to flooding. 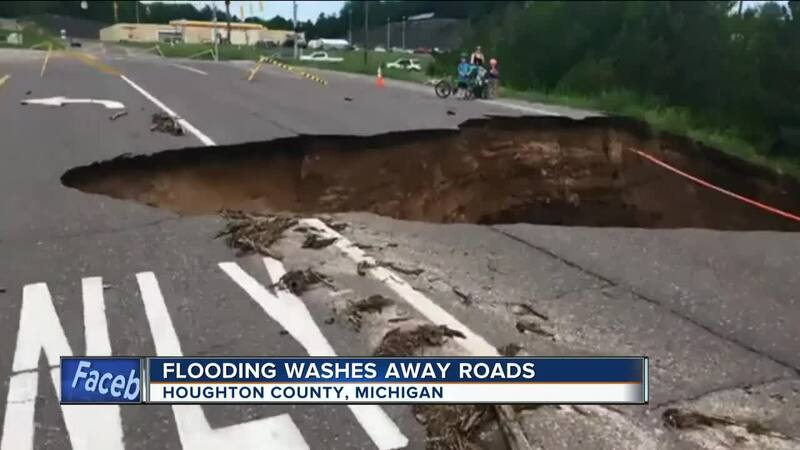 And U.S. Highway 63 was shut down by flooding in the Drummond, Wisconsin, area, where the National Weather Service says more than 11 inches of rain fell overnight. In Minnesota, State Highway 23 was closed for repairs where it washed out at the Nemidji River bridge in Carlton County, about 14 miles southwest of Duluth, the Carlton County Sheriff's Office said. The sheriff's office said highway crews were also working Sunday on several other washouts and flooded roads. Temperatures reached the high 90s Sunday in Chicago, approaching if not surpassing the hottest June 17 on record -- 96 degrees in 1957. Much of the region that wasn't enduring storms was experiencing a similar heat wave.